It has not been easy but Perpignan Basket ended the season by playing basketball at its best during overtime to beat Toulouse (75-71) to become only the second team to win the regular season title and the Final Four. Veuillez trouver en bas du page un résumé sur les matchs de la deuxième journée de la finale à 4. 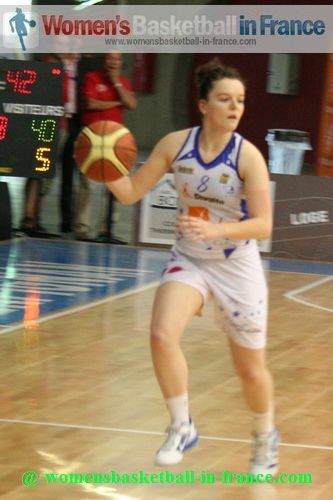 Héléna Ciak has been playing basketball at another level this season and she showed this again in the final after just 4 points and 4 fouls during the first 15 minutes. With her actions she won the MVP award for the Tournament. With her team trailing by 10 points with 13 minutes to play, she returned to action and scored 17 points, made 4 blocks and picked up a number of crucial rebounds to see her team through. 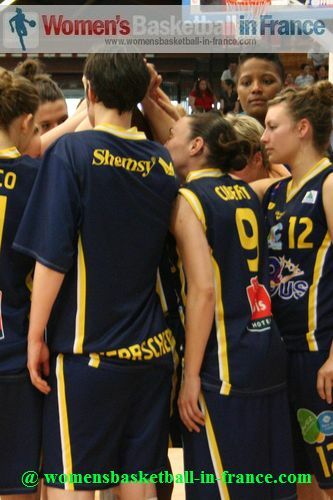 In the final match of the LF2 season Toulouse did everything right for 27 minutes. Leading by 12 points the French championship was theirs for taking. 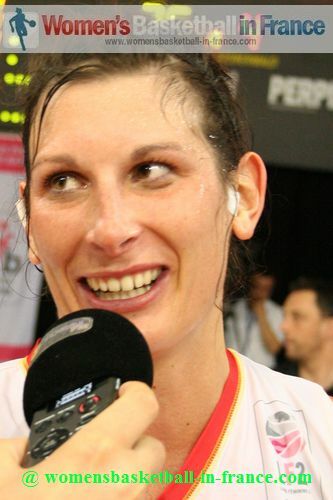 But Ciak and Clémentine Samson had other ideas and in a frantic 4th quarter they made up a 12-point deficit and were just 0.7 seconds away from winning the game in regulation time. 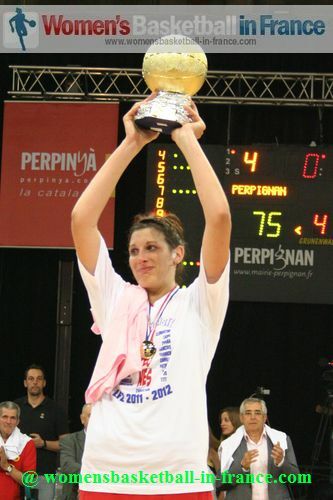 In the end Perpignan had to wait until overtime to seal the victory from the charity stripe with Ciak closing the scoring. 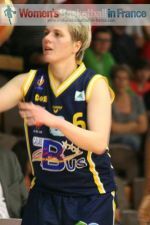 In the match for third place COB Calais ran out victors thanks to some solid play by Emilie Duvivier (in picture) who started with two big three-pointers in the first quarter. 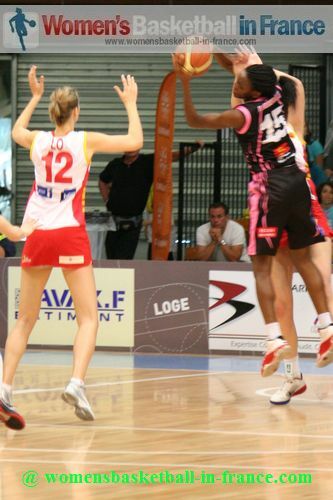 However it was her second-quarter contribution of 11 points in a 17-3 run that put Calais in control for good. 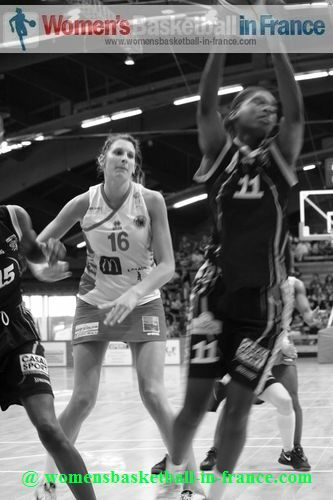 Mélanie Arnaud was her usual effective self with 20 points and 12 rebounds without stealing the lime-light as Calais ended the season on a high by beating Voiron (80-66). Voiron did what they could but with injuries shortening their roster they had nothing left in the tank to challenge Calais. 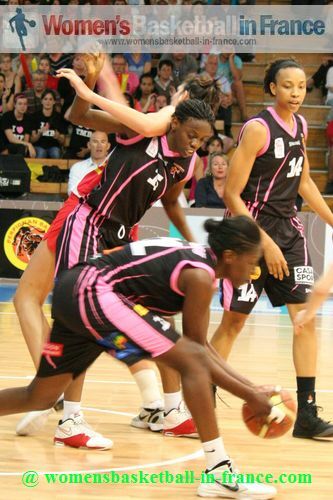 Fans of L2F 'women playing basketball' were given a treat as Perpignan and Toulouse battled away for 45 minutes in the final game of the 2011-2012 LF2 season. 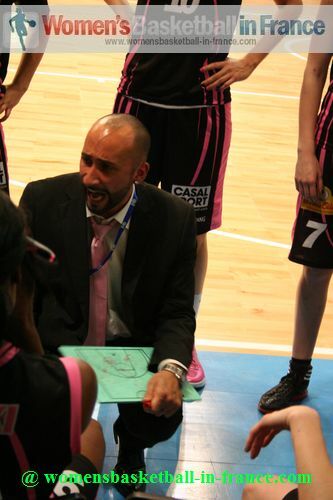 François Gomez made some tactical changes to his starting five with Princesse Goubo and Camille Ruiz coming on. He was rewarded as the two players combined for the first 2 points of the game. 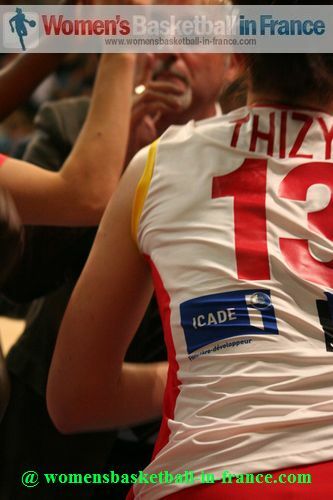 However Nina Bogicevic hit back for Toulouse almost immediately and the match was launched. It was almost like watching arm wrestlers in action as the advantage moved from one side to another at each attack. 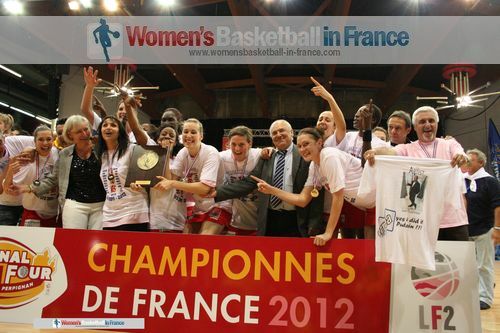 Toulouse's full court offensive worked wonders as they moved ahead (13-9) thanks to a three-pointer by Agathe Degorces. 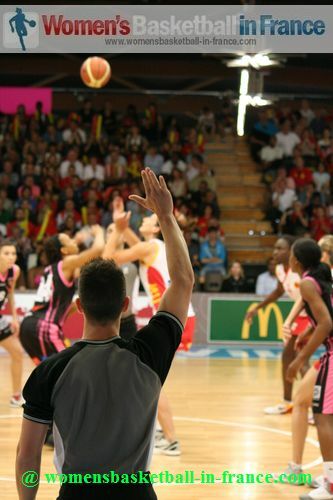 Toulouse's early aggression paid off because Héléna Ciak picked up 2 first-quarter fouls, while the duo of Carrem Gay and Bogicevic assured to win the first quarter (25-17). The second quarter continued in the same way as the first with both teams trading scores with Toulouse holding on to their advantage (29-23) with 13 minutes played. Gomez was struggling with his rotation and to make matters worse Ciak picked up her 3rd foul two seconds after coming on. 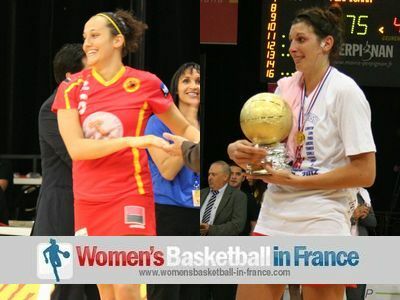 Toulouse with Bogicevic on fire went 11 points clear (36-25) with 15 minutes played. Ciak returned and scored 4 quick points but this was not enough as she soon picked up her 4th foul. Although Goubo was playing well and her heart out, Gomez decided to use Isabelle Strunc (right in picture) as the point guard. His tactic worked well because Stunc with her way of weaving in and out either led to assist or free throws. Perpignan were able to reduce the deficit by the end of the half (36-42) thanks to this approach. 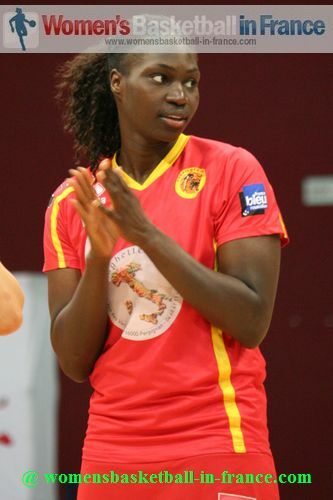 But in the beginning of the third quarter nothing was really working for the hosts with Fatou Dieng failing to get into the game and Goubo playing with a shoulder injury, hence less effective, while Pauline Lo was invisible. 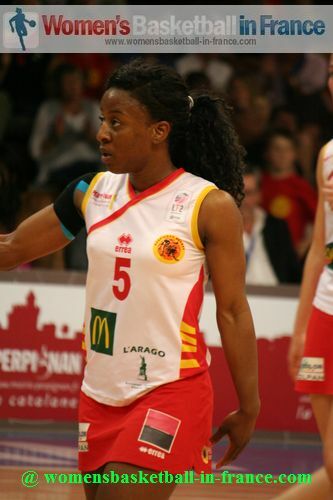 If not for Laina Badiane Perpignan would have been out of the game. Toulouse continued running circles around the hosts but failed in putting the game away. 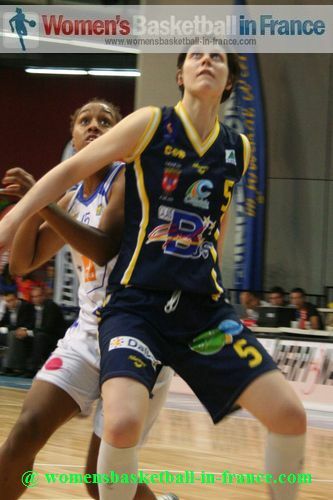 When Degorces hit a big three (55-42) with 27 minutes played, Gomez had no option but to bring Ciak back into the game as well as Clémentine Samson. The result was the hosts started scoring but still trailed by 10 points going into the final quarter (47-57). However things were to change for Perpignan as Samson hit shot after shot including a big three-pointer. With six minutes remaining the deficit was (56-61). Perpignan continued their fightback with the duo Samson and Ciak and the teams were level (62-62) with three minute to play. The home fans thought that victory was in the bag after Ciak put them in front with 1.18 minutes left. But with 20 seconds left to play Ciak missed the chance to win the game by splitting a pair of free throws. 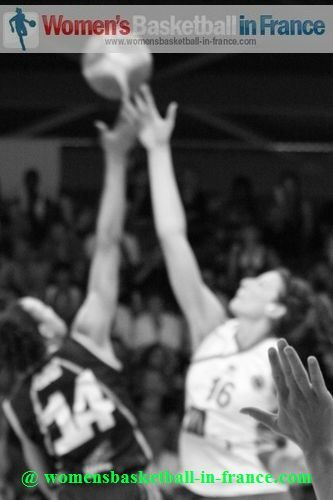 When Gay buried a three-pointer with 0.7 seconds left Toulouse forced overtime. Perpignan went to score 5 consecutive points while Toulouse kept on missing during the first 3 1/2 minutes of overtime. 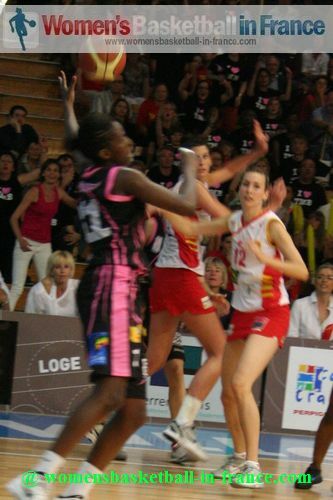 The only time Toulouse looked to score was with Darline Nsoki driving to the basket, Ciak came up with the block of the match. 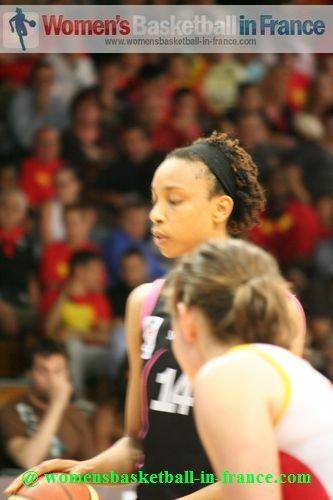 With Badiane fouling out, Lorraine Lokoka used the extra space to finally end the barren spell for Toulouse. However it was too late and with time against them the match was played out on the free-throw line with Perpignan going 4-of-5 to win the game (75-71). The first 10 minutes were played at pace as both teams went for the bronze medal. Once again scoring was difficult and each player had to work hard for each point. 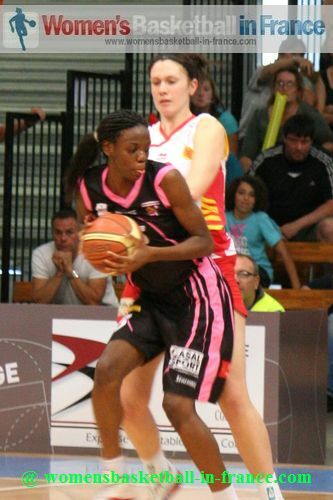 For Voiron Cyrielle Reccoura was unstoppable on the fast break and helped herself to 11 first-quarter points. 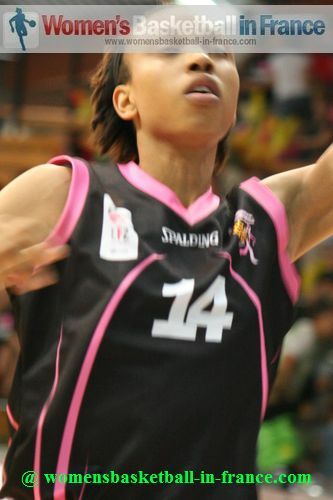 For Calais Mélanie Arnaud was again getting herself in the paint to score frequently as her team edged the first quarter. 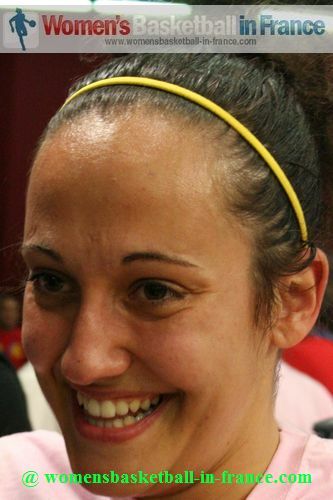 Aurélie Cibert, the captain of Calais, was substituted after 10 seconds to never return. Voiron looked to have the better of Calais at the start of the match and scored the first 8 points of the quarter to lead (28-22) with 14 minutes played. 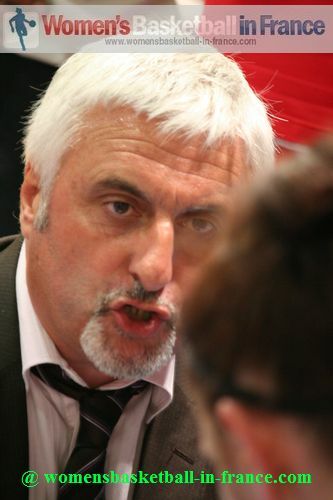 It then required a lot of shouting by Cyril Sicsic to finally get his players out of their slump with finally the quarter turning into a Emilie Duvivier festival. Duvivier scored 11 points and had 1 assist during the 17-3 run to put Calais back in control heading into the break (39-31). Amanda Lassiter almost ended the first half on a high as her half-court buzzer beater attempt bounced off the rim. The third quarter was played slowly which suited Calais as they pushed their advantage into double digits. For Lassiter the rim jinx continued as most of her attempts rolled out. Calais went into the final quarter leading (58-49) and had secured the victory with a 10-0 run for a commanding advantage (69-49) with six minutes to play. 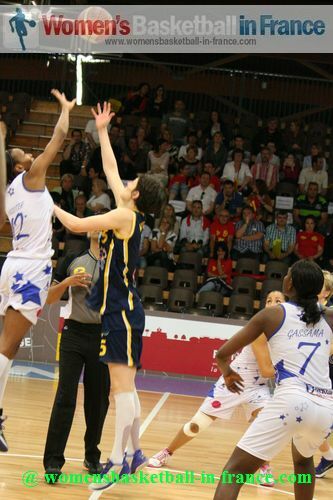 The match played itself out with all the players getting some play-time as Calais won (80-65). For Sicsic it was his last match in charge of COB Calais. He has signed a one-year deal with Ligue Féminine side Tarbes. It was also the last game for Bertrand Parvaud in charge of the first team in Toulouse. Quoique Toulouse avait tout pour gagner le match de la première place, c'étaient les jeunes joueuses de Perpignan qui prenaient les choses en main pour changer le destin de leur équipe. Au money time, avec la combativité de Héléna Ciak (21 et 12 rebonds, 3 passes décisives), l'énergie de Princesse Goubou (5 et 2 passes décisives), le shoot adroit de Clémentine Samson (9) et le sang froid de Isabelle Strunc (14 et 2 passes décisives, 6 fautes provoquées), Perpignan revenait de loin pour gagner le titre de Champion de France. A ne pas oublier les adversaires jeunes de Toulouse avec Agathe Degorce (10 et 6 passes décisives, 4 fautes provoquées) et sa vision de jeu, Darline Nsoki (4 et 3 passes décisives, 3 interceptions) et ses sacrifices, Maud Medenou (8 et 7 rebonds, 4 fautes provoquées) et sa défense tout terrain, Nina Bigicevic (19), la shooteuse, et Lorraine Lokoka (9) et ses drives, qui montraient elles aussi qu'il y a un futur dans le basket féminin. La finale était brillante avec les deux entraîneurs jouant des jeux psychologiques dont ni Matthieu Chauvet, ni François Gomez gagnait la partie: Chauvet avait préparé un plan pour écarter Héléna Ciak, son ex-prodigée de Roche Vendée de la saison dernière, et Gomez répondait avec un changement des cinq du départ. Le jeu était tant calculé et surprenant que Carrem Gay avait le ballon pour un tir à 3-points pour égaliser afin que Toulouse pouvait forcer prolongation (65-65). Pendant que les jeunes continuaient à se livrer des combats rudes, les vétéraines des deux équipes calmaient leurs partenaires. Et avec beaucoup de chances, Perpignan gagnait de 4 points (75-71). Héléna Ciak a été élu MVP du tournoi de finale à 4. Au contraire dans le match pour la troisième place, les vétéraines de Calais avec Mélanie Arnaud et Emilie Duvivier qui contribuaient 42 points sur 80 contre Voiron dont Amanda Lassiter avec 19 points et Faëza Bouderra avec 14 points étaient les meilleures marqueuses. L'absence de la capitaine de COB Calais Aurélie Cibert à cause d'un problème au genou et Mélanie Devaux avec 5 fautes très tôt, la jeune Pauline Diawakana avait l'opportunité de pouvoir montrer ses talents (9 points). Pour Voiron les jeunes Laure Mercier en tant que meneuse et Johanna Joseph avaient aussi assez de temps pour jouer pendant ce weekend pour prouver leurs talents. Même Olivia Canoine qui remplaçait Magali Mendy à la fin de le rencontre porter haut les couleurs de Voiron et marqua un joli 3-points. C'était Calais qui remporta la victoire, plus fort et organisé contre une formation de Voiron diminuée (80-66).